Today's classic clash between the Spanish giants Real Madrid and FC Barcelona was not as exciting as previous matches. Before the match, nobody had scored against Barcelona during this season, and perhaps some were expecting Barcelona to have an advantage when Neymar brought them ahead 1-0. But truth is that Barcelona's goalless record has been against other teams in a league where only Atletico Madrid, Real Madrid, and marginally Valencia and Sevilla, are quality sides. Truth is that Barcelona was facing quality opposition for the first time. In the Champions League another quality side, Paris St. Germain, had already exposed the Catalonians serious defensive deficiencies. Today Real Madrid exposed them as well, and could have made the Catalonians look ridiculous if they had been more cynical. That said, when getting into the match Real Madrid was splendid: disciplined and quick on the counterattack, and with players working hard for the team (something that has often been missing in the club). Luka Modric and Toni Kroos were both fantastic in midfield, while Marcelo and Isco were a constant threat on the left side. And then the trio of Ronaldo, James and Benzema far out-shined the tired-looking trio of Messi, Suarez and Neymar. Granted, Neymar scored and Suarez is still to understand his new teammates, but more worrying for Barcelona is the lack of depth, which is particularly acute in defense: Javier Mascherano continues to play in a position that is not his, while Pique lacks the quality to play at this level without Carles Puyol next to him. Tonight, he proved again that he is a player that can not be called more than mediocre, and he could have cost Barcelona much more than the one penalty that he gave away. This will be a great season for Real Madrid, who were also impressive in the Champions League last week against Liverpool. Barcelona on the other hand, will have it harder and harder as they face will face quality teams. Last season Liverpool came as close to winning the Premier League as they have come for a long time, and this had led to hopes rising among Liverpool fans for this season. So far, they have been disappointed, and the 0-3 trashing they received by Real Madrid in the Champions League only showed how far Liverpool are from reaching the levels of the world's best teams. If anything, Real Madrid were nice to play at a lower tempo, or the trashing could have become as embarrassing and overwhelming as what Bayern Munich had done in Rome the day before. What perhaps symbolizes Liverpool's fall compared to last season is the players they let go, and the replacements that came in. Liverpool's defense is, if not a joke, somewhat comical, and while one can question the quality of current defenders, their lack of experience seems unquestionable. But one of the most clear changes in Liverpool is the absence of Luis Suarez, the "biter", and his replacement with Mario Balotelli. Liverpool good rid of a troublemaker, yes, but a quality and hardworking player, who despite his lack of discipline, always put the team ahead of himself. What Liverpool did well was to manage to rein in his psychotic traits during matches, and then get the best from his genius. They undoubtedly have been hoping to do the same with Balotelli, but the problem is that Balotelli's issues are different. While Suarez has been a problematic star in every team he has been at, Mario Balotelli has been a super talented problem child in every team he has played at. He has amazing skills, but he is lazy and self-centered; everything is about Balotelli. His controversial shirt swap with Pepe during half time of the match exemplified a player who thinks of himself before the team; his attitude and lack of fighting for the team on the pitch exemplifies this even more. Perhaps Liverpool can change Balotelli. I hope so, because he is a fantastic player. But I doubt it, and I think Balotelli will turn into one of the flops of this season's Premier League, along with Liverpool's hopes to have a better season than last. For the first time since 2006 Spain lost a qualifier, when they lost 2-1 to Slovakia in their qualifier for Euro 2014. And as everyone in Spain seems to be doing these days, they blame Iker Casillas, who made a mistake in allowing the first Slovak goal. Spain should be thankful to Iker Casillas, a true gentleman and great sportsman: he and Carles Puyol were more than anyone else the architects behind the team that won the World Cup and two European titles. And now they should perhaps be more thankful than ever: they can continue blaming a man who has done everything for Spain and for Madrid, for every crap performance of their team. Because Spain should face the truth; the problem is not Iker Casillas. It is Vicente del Bosque. With a lot of possession and dominance Spain only shot on goal seven times, and they continue insisting on Diego Costa, who is a genious under Mourinho, but who does not fit into the style of Spain. The refusal to use some of the yougn players was partly corrected when Paco Alcacer finally came on for David Silva and scored. But only partly, and Vicente del Bosque's refusal (or incapacity?) to change and to renew, will end up making the near future difficult for Spain, despite the country, along with France and Germany, having the most outstanding pool of football talent in Europe. After a lovely morning in Brussels with running, museum and coffee, I decided to go into a pub to watch Valencia and Atletico Madrid, defending Spanish champions, play in the Spanish League. The bar was full of Atletico Madrid fans, who were being loud, obnoxious, and annoying. They are just like me, who fifteen minutes into the match could smile satisfied to myself, as Valencia was leading 3-0 after playing like a whirlwind and facing an Atletico defense that had not really realized that the match had started. Miranda scored an own goal, which would have been a great goal had it been in the opposite side, while newcomers Andre Gomes and Nicolas Otamendi scored the other two. The sudden lead would perhaps have made many other teams fall apart, but one must respect Atletico Madrid, who fought their way back into the match, and dominated the remainder of the first half. Mario Mandzukic scored, but just before halftime Diego Alves saved a penalty from Guilherme Siqueira. Diego Alves is set to become the goalkeeper with most penalty saves in the Spanish league. 3-2 at halftime would have further unnerved Valencia, who second half were pressed back, and only had occasional counterattacks, but surviving Atletico Madrid's pressure. 3-1, and with this victory Valencia has shown that their newly-found resurgence is meant seriously; that they are ready to challenge the big ones in la Liga, and that they intend to return to Europe. It has been another great round of Champions League matches, where all teams but three have managed to get points after two matches. CSKA Moscow are the only bad team, while Ludogorets Razgrad have been unlucky to lose to Liverpool and Real Madrid. In the meantime, Benfica, with two losses, must be the biggest disappointment so far. In this round Malmo FF defeated Olympiakos, and while Atletico Madrid defeated Juventus, all teams in that group A have a victory, making it a very exciting and surprising contest. In Group B FC Basel today defeated Liverpool, who is performing far below (their own) expectations. FC Basel has been a giant killer for many years, and Liverpool seems to have forgotten... So in Group B Basel and Liverpool are trailing Real Madrid, but do not discount Ludogorets just yet! In Group C, where I had the pleasure of seeing Anderlecht and Dortmund play, the Germans from Dortmund seem to be the team to beat. In the meantime Arsenal rose from the ashes to trash Galatasaray 4-1, with three goals of their new star, Danny Welbeck. It is always special to go to a Champions League match, where the football quality is so high and the atmosphere electric. 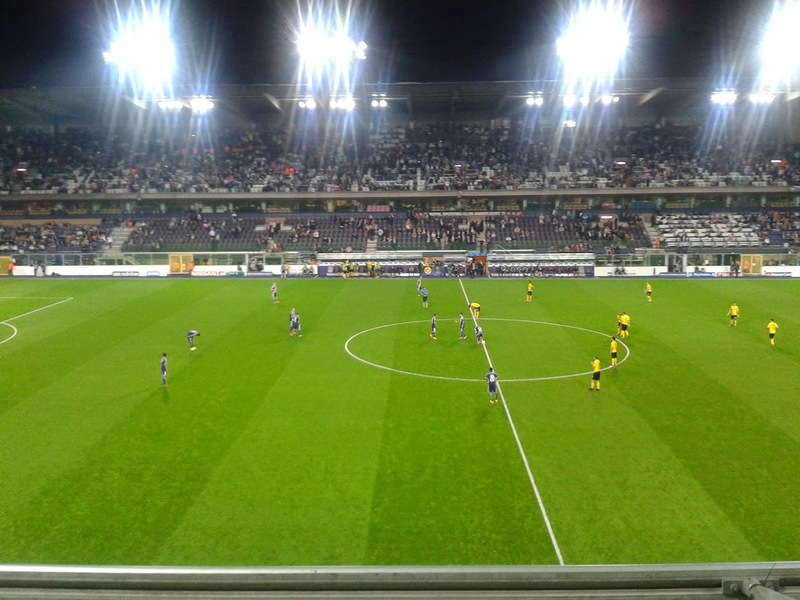 This was certainly the case today in a beautiful evening in Brussels for the match between the home side Anderlecht and the German giants Borussia Dortmund. Anderlecht were understandably full of expectations after a flying start to the season and a good away result in Turkey against Galatasaray. The many injuries for Borussia Dortmund perhaps added to the expectations, but truth was that the young Anderlecht side today faced a side that was world class. It is a joy to watch such a team play, and I greatly enjoyed seeing the speed, movement and technique of a team like Dortmund. I was particularly impressed about Shinji Kagawa distributing the balls, Pierre Emerick Aubemeyang and Ciro Immobile as eternal threats (Immobile scored the first goal on great combinations with Kagawa), and in defense, the great Neven Subotic. That said, I have a soft spot for Anderlecht, and would have liked to see them do well against the giants. And in fact, they did not do bad; Dortmund were simply much better. The score of 0-3 was perhaps too much, with Anderlecht also having a few big chances, but truth is that just a few mistakes and lapses will not be forgiven by a team like Borussia Dortmund. The German side should also be considered as a candidate to get far in the tournament. The best were the fans: the Anderlecht fans were full of expectations and displayed a large banner at the start of the match, and supported their team well even when behind. At the same time the Dortmund fans were simply amazing. It must be such a boost of energy for the players to have supporters like that! I now wish more than before, that I can someday go and experience a match in Dortmund! Paris St. Germain's match against FC Barcelona in the group stages of the Champions League was worthy of a final, as Paris won 3-2, and certainly announced themselves as serious candidates for the title. FC Barcelona had looked awesome at the start of the season without any goals conceded, but that was to change when David Luiz brought PSG ahead on a blunder of the Barcelona defense. David Luiz, always somewhat irregular in his movements, played a great match, but certainly must have given PSG fans their moments of nerves. Without Ibrahimovic it was Edison Cavani and Javier Pastore who led a great attach by PSG, where Marco Verrati and Blaise Matuidi both scored for PSG. But also FC Barcelona showed great attacking power and the goals by Lionel Messi and Neymar were both of the high quality one has grown accustomed to with Barcelona. One has to wonder whether Barcelona's awesome statistic is more because they have not faced qualified opposition yet, as they certainly did yesterday. The match showed that while outstanding, FC Barcelona certainly have weaknesses, and PSG that they must be reckoned with.